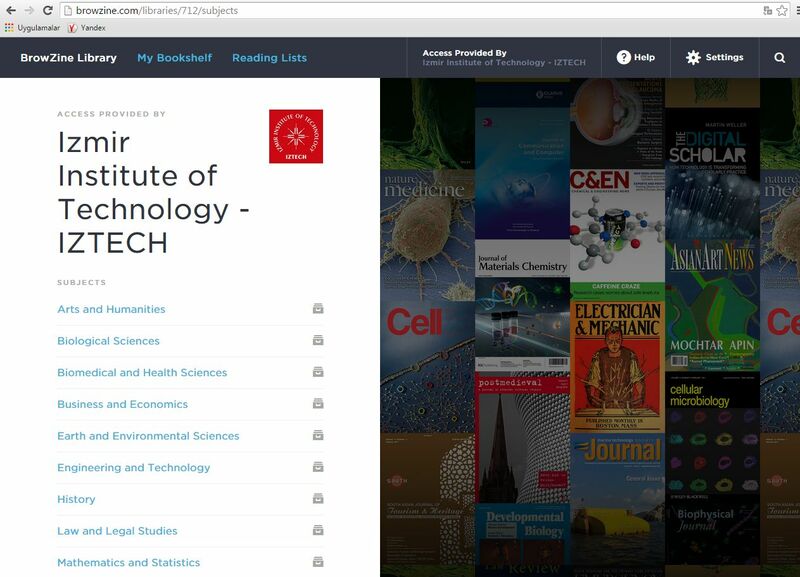 BrowZine delivers thousands of academic journals to your iPad or Android tablet or smartphone. BrowZine works by making most online journals offered by the IZTECH Library instantly available on one common newstand app, which you can customize to your interests. Use BrowZine to easily keep up with the newest article research in your field! Download BrowZine: From your Android, iOS or Kindle Fire device, visit the Apple App Store, Google Play Store or Amazon App Store. Search for “BrowZine” and download the app to your device. Access BrowZine: Tap on the app icon to open BrowZine. A list of libraries will appear, please select Izmir Institute of Technology - IZTECH. Enter your credentials, these will be the same used for remote access. BrowZine Web is available also. BrowZine will automatically detect if users are on campus and select your library; if off-campus, users will be prompted initially to select IZTECH library.